Andrew founded the successful and internationally renowned Red Ochre Restaurant’s in the 90′s, but now works as a consulting/guest chef and educator, regularly invited all over the world. Andrew was also the inaugural Chairman (currently deputy chair) of ANFIL (Australian Native Food Industries Ltd.), the peak industry body for the native food industries founded in 2006. 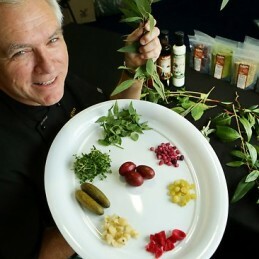 He resides in Adelaide with his family and is currently working on new retail products and his long awaited cookbook.